Most of the available public space in Beirut is appropriated and restricted by private interests. Furthermore, the majority of the city’s districts suffer from inadequate and insufficient basic amenities. The lack of public spaces and services leads to an unjust to the Beirutis. This project aims to create a sustainable autonomous space of interaction that provides services: social infrastructure for all. To compensate the lack of municipal services, the proposed entire first floor of the existing building is equipped with public kitchen, laundry room, charger spot, library and digital access. All these functions are supported by the energy produced on the roof (solar panels). While avoiding the demolition of the existing building and preserving the vertical circulation and plumbing, the aim is to offer affordable housing and amenities for the neighbourhood: ultimately the City. In dense Beirut, most of the available public spaces are appropriated by private interests. Furthermore, the majority of the city’s districts suffer from inadequate and insufficient resources, with 94% tap water being contaminated and 92% being discharged without treatment. In addition, with the minimum 3 hours of daily power cut with acute 42% power loss due to tampering, there is a dire need to optimize the resource utilization. The vacant apartments, evictions, and pressing need for affordable housing, suggest communal living to address the above mentioned issues. 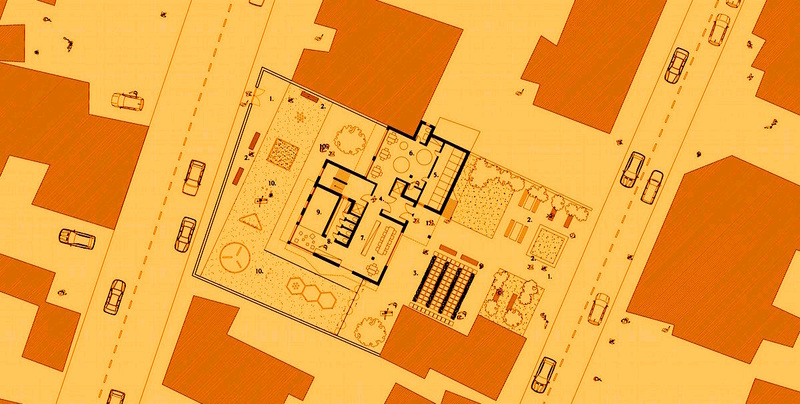 This project is an attempt to create a sustainable autonomous space of interaction and dependence through the process of unifying and sharing uses turning for the neighborhood. Proposing a multi-generational and co-existence space; along with a communal floor, offering social infrastructure to the residents and neighborhood alike, the project creates a new vertical circulation system. This is capable of transforming, through an architectural way, the public space of the City. Working spaces, libraries, kindergarten, are separated with the semi- private and private zones. The multi- generational concept is realized right from the entry to the site with outdoor spaces, kids play area attached the kindergarten, and the interaction space for the residents and the neighborhood as well. The communal floor is the most significant floor in the scale of the neighbourhood and by extension, in the scale of the city. Somebody can reach this space on the first floor of the building directly through the external staircase. The role of the floor is to fill in the lack of the municipal services providing social infrastructure. This entire floor is completely public and equipped with 24/7 electricity and water facilities, which are supplied by solar panels and water treatment plant. The seating arrangement allows the elderly to interact with one another and be in contact with the children. The communal floor is the key concept in the program. Starting from the communal kitchen, the vision of both optimizing resources and connecting people, it is focusing on the concept of living together in harmony. The shared laundry further points towards both space optimization and resource efficiency in the building, and neighborhood on the whole. The diagnosis of the water supply and discharged is being addressed with the help of both rain water treatment plant and waste water treatment in site. The library, along with the working rooms, and discussion space adds to the social inclusivity. The co- existence space equipped with wifi, uninterrupted power supply from the rooftop solar panels and the DC lighting, helps all stay connected even digitally. The minimum 3 hours power cut would be rush hour in this space, as it would be both well ventilated and offer charging spots for mobile phones and laptops. With regard to the housing, the rooms are designed addressing the lifestyle and requirements of the end uses. It varies from apartments for elderly and families to rooms for students. This helps not only in offering what the user needs, but also makes sure the user only pays for the space utilized and required; responding to the affordability spot. The overall program is planned with a vision of extending services to the neighborhood, while offering the spaces suiting the different generations and groups. With the energy efficient technologies in place, the building therefore becomes a resource source.